Who am I, a Ferrari or a Mini Minor? When I meet my clients for the first time, I outline my life coaching program and explain that the first stage of personal growth is discovering who we are. When we want to achieve something, we need to define the person who wants to achieve it. If you are a car going into the race of life, you need to know if you are a Mini Minor, a Ferrari or a Chevrolet Truck, because each of them has a different seating capacity, a different size engine, a certain size fuel tank and its own particular set of wheels. The race of life is not the same for all. The way a Ferrari functions is not the same a Mini Minor, so one size does not fit all! It sounds trivial, right? Surprisingly, it is not. Absolutely. That is exactly what I mean. I do not blame them. I totally understand what it means to define myself based on what others expects me to be, because we all do it, until we have the courage to redefine ourselves despite what others think. Fear plays a big part in this self-definition. At least, fear plays a big part in the distorted definition of self that most people have. Apart from the fear of getting physically hurt, which is a survival mechanism that is generally healthy for us, most other fears are related to our desire to be accepted, loved, appreciated, rewarded and connected. Do you know what is common to all of these desires? They depend on other people’s thoughts, beliefs and actions. We cannot help ourselves get them. As a parent, if you complain that your kids do not take responsibility, take responsibility for planting in their mind the idea that their identity depends on your approval. People are afraid of many things that are related to others. In all of them, they would like others to think highly of them and they become addicted to this external approval. Once the approval is not there, they have an identity crisis. I call it The Disease to Please and whether you like it or not, raising kids with this disease to makes their life with you a bit easier for you, but it is going to cost them a life of misery. 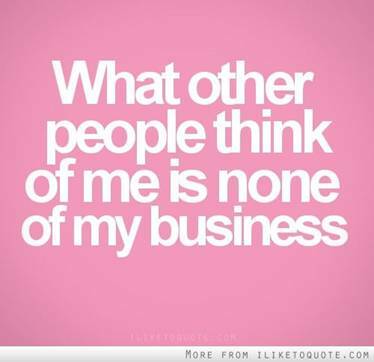 Here is a simple example of living by what others think of you, rather than making up your own mind about who you are. Your parents raise you to think that to please them, you have to speak your mind. Your teachers say that to please them, you need to shut your mind up (my version of “keep your ideas to yourself and never express them if they don’t go hand in hand with what the teachers is expecting, or else…”). Your friends, on the other hand, say that to please them, you need to participate in sports, even if you hate it. What do you get when there are so many contradicting messages? Very confused children, who do not know who they are and grow up to be confused adults, who raise confused children… They will be people who do not know which rules to use to navigate life. People with no GPS. In reality, we will always get conflicting messages, because every person we meet is different and has a different agenda. If we try to please them all, we will be very confused and miserable, because it is simply impossible. This topic comes up in each of my school leadership programs. I usually work with a group of 50 student-leaders about fear and the definition of self. It amazes me every time to discover how many of these students, who are at the top of their schools, still worry a lot about what others think about them and this affects their confidence. Many of them are visibly afraid to express themselves. Usually, they are very surprised. Here is an example of a discussion I had recently with a group of students. One amazing, independent teen girl told me that this message was a contradiction to everything they learned at school. I told her I understood it might sound like it and asked the rest to share their opinion about it as well. He thought about it for a while and said they had more experience. Another student said that if this were true, we would not have adults who are homeless, criminals or “total losers” (his words), because they have lots of experience, so maybe it depends on the type of experience. We then started talking about “the right thing”. One student said that there is no such a thing as the “right thing”. He claimed that what works for one person may not work for another and what seem to be “the right thing” may work in one setting and might not work in another setting, which immediately makes it “not the right thing”. Another girl responded a bit aggressively, “She didn’t mean that. She said you need to develop some independent thinking”, and they started arguing, because the tall girl felt insulted. After a minute of rough talk between them, I asked the tall girl why she was upset. She pointed at the other girl and said, “She said I didn’t have any independent thinking”. The room went quiet and everyone smiled. The tall girl said, “Well … no, not really”, and she smiled too. We, the leaders who ran the show, did not share our opinion at all. We only asked the kids to clarify the answers, yet the discussion was amazingly insightful. It took them about half an hour to convince one another that this philosophy of not bothering about what others’ think about them is another way of taking responsibility over their own thoughts, beliefs and actions, and that it helps develop their “internal GPS”. Yes, it will sometimes take you the long way, but if you keep updating it, you will be fine. We went on with our activities. During the day, I gave them assignments that were extremely difficult. I put them on the spot and questioned their thoughts, ideas and philosophy. When they offered suggestions, I doubted them. Before our morning discussion, whenever I doubted them, they curled up, became insecure and gave up their ideas immediately. They said, “Never mind”, “It’s a silly idea” or “I’m not sure you’ll accept my idea”. I reminded them several times that what I think is just my opinion and none of their business and that standing up for what they believe is one main ingredient of being a leader. In the later part of the day, when I challenged their ideas, they did not give up and stayed in the discussion, expressing themselves more and more confidently. Even the kids who hardly spoke at the beginning of the day were more courageous, stood their ground and smiled when I questioned their thoughts, beliefs and ideas. As soon as I set them free from the fear of what I think, their expression became more sincere and more confident. They could share their thoughts openly, without the burden of worrying what I might think, and they were brilliant! In the evening, we had a 2-hour session with their parents. We had an activity with the parents and students leaders together. All the students took an active part in it. At the start of the day, some of the students whispered their thoughts and opinions. Some also shared a great fear of speaking in front of people. In the evening, they all expressed their thoughts and opinions in front of 120 people, including their parents, loud and clear. It is simple. Teach your kids to use this like a mantra whenever another person says things about them that disagree with what they think, even if the other person is you. Teach your children to consider what others think about them someone else’s opinion. People are entitled to their own opinion and we are entitled not to accept it. It is just an opinion! If someone who thinks he is a Ferrari tells them what “the right way” to drive though life is, they can think that it is a Ferrari’s opinion and it is quite possible that it is “the right way” for a Ferrari, but it may or may not be for them. Teach your children that if they allow everyone else’s opinions into their mind, there will be no room for their own thoughts. As a parent, if you want them to believe that you mean it, encourage them to share their opinion, even when they are different from yours. Congratulate them when they form their own opinion. When you do that, you will free them from the burden of society. When you have the courage to send them this message, you will heal them from one of the most painful diseases of humanity, the disease to please. I did it in 12 hours. You have 10-15 years to do it, and you will get extremely healthy and confident children.